Dignitaries at the plaque unveiled by Mr Peter Blackwell JP DL. (c) Friends of Tunbridge Wells Cemetery. 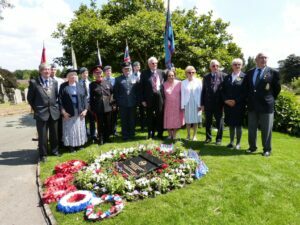 Deputy Lieutenant Peter Blackwell JP DL represented the Lord-Lieutenant of Kent at the RAF 100 plaque unveiling event at the Tunbridge Wells Cemetery on 14th July. The unveiling of the memorial was to commemorate the 100th anniversary of the RAF and in memory of the 24 RAF personnel buried there. Deputy Mayor Cllr James Scholes laid a wreath on behalf of the Tunbridge Wells Borough Council and in his address mentioned that he was born six weeks after his father had died serving in the RAF. During the ceremony the band of 128 (Tunbridge Wells) Squadron ATC played four pieces. Mr Blackwell also gave an address where he referred to the three themes of RAF 100 – Commemoration, Celebration and Inspiration and he made reference to Royal Tunbridge Wells being the only town in the country to unveil a Memorial to the RAF dead of WW1 and WW2 as part of the Anniversary.